Suzuki’s 2018 Gixxer Cup series has got underway in India at the Kari Motor Speedway in Coimbatore, India with a sell-out crowd and exciting action. Now in its fourth season, and for the third year hosting the Redbull Road to Rookies Cup, defending champion Joseph Matthew continued his strong run of form from last-year, overcoming a highly competitive grid, and challenging racing conditions to win both races of the season while in the Suzuki Gixxer Redbull Road to Rookies, it was Zothanmawia who took the top-honours in both. In the Race 1, Matthew, who hails from Chennai, had established a strong lead in the initial laps clocking 14:15:877 minutes over 10 laps. 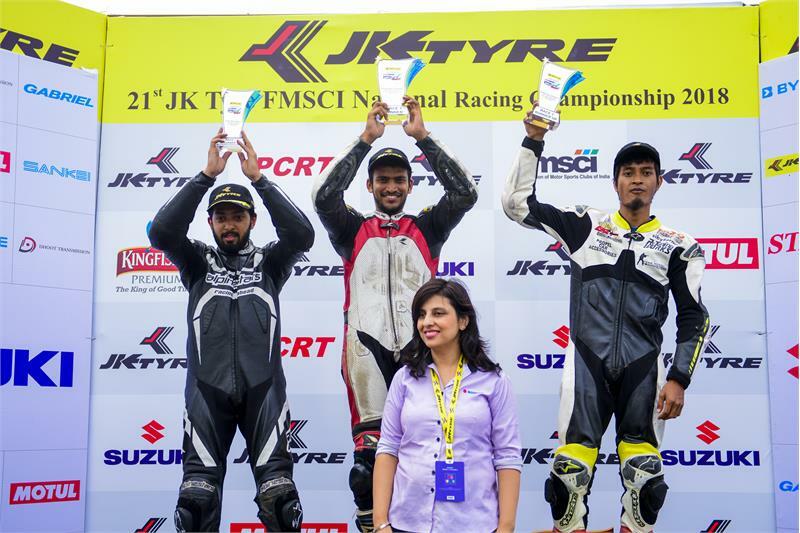 The fight for the second-spot had been a more closely contested affair between Aizwal’s Malsawmdawngliana (14:19:122) and Bengaluru’s Syed Muzamil Ali (14:19:181), with the former prevailing by a margin of just 59 milliseconds. It was a similar story in the Race 2 as well, with Matthew leading from start-to-finish, clocking 14:16:799 seconds, which also included this weekend’s best lap-time of 1:23:411 minutes. However, it was a role-reversal for the second and third spot as this time Syed Muzamil Ali (14:18:749) managed to narrowly edge past Malsawmdawngliana (14:18:951) in an exciting finish. At the end of Round 1 of the Suzuki Gixxer Cup, Matthew leads the championship table with 20 points with Syed Muzamil Ali and Malsawmdawngliana in keen pursuit at 14 points each. Anthony Lalawmpuia, from Aizwal with 8-points occupies the fourth-spot, followed by Clinton Cordeiro with 7-points while Vidhan Dubey from Bhopal, and Sanjeev Mhatre, from Mumbai are tied at 6-points each. Meanwhile, the Suzuki Gixxer Redbull Road to Rookies, was completely dominated by Zothanmawia. During Race 1, he clocked 14:23:901 minutes, while in the Race 2, he clocked 14:36:129 minutes including the round’s best lap time of 1:24:176 minutes. Aizwal’s PC Andy Lalhmangaihsang (14:47:701) emerged second in the Race 1 ahead of Jerome Vanlalrengpuia from Lawngtla, (14:50:264); while in the Race 2, Jerome from Lawngtla (15:04:514) wrested the second-spot from PC Andy Lalhmangaihsang (15:13:476) who finished third.